LeBron Raymone James is an American professional basketball player for the Cleveland Cavaliers of the National Basketball Association . James has won three NBA championships , four NBA Most Valuable Player Awards , three NBA Finals MVP Awards , two Olympic gold medals , an NBA scoring title , and the NBA Rookie of the Year Award . He has also been selected to 12 NBA All-Star teams, 12 All-NBA teams, and six All-Defensive teams, and is the Cavaliers' all-time leading scorer. 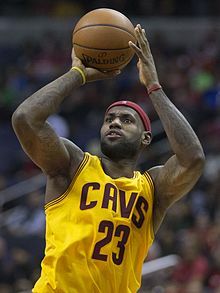 LeBron Raymone James (/ləˈbrɒn/; born December 30, 1984) is an American professional basketball player for the Cleveland Cavaliers of the National Basketball Association (NBA). James has won three NBA championships (2012, 2013, 2016), four NBA Most Valuable Player Awards (2009, 2010, 2012, 2013), three NBA Finals MVP Awards (2012, 2013, 2016), two Olympic gold medals (2008, 2012), an NBA scoring title (2008), and the NBA Rookie of the Year Award (2004). He has also been selected to 12 NBA All-Star teams, 12 All-NBA teams, and six All-Defensive teams, and is the Cavaliers' all-time leading scorer. James played high school basketball at St. Vincent–St. Mary High School in his hometown of Akron, Ohio, where he was highly promoted in the national media as a future NBA superstar. After graduating, he was selected with the first overall pick in the 2003 NBA draft by the Cleveland Cavaliers. James led Cleveland to the franchise's first Finals appearance in 2007, losing to the San Antonio Spurs. In 2010, he left the Cavaliers for the Miami Heat in a highly publicized ESPN special titled The Decision. James played four seasons for the Heat, reaching the Finals all four years and winning back-to-back championships in 2012 and 2013. In 2013, he led Miami on a 27-game winning streak, the third longest in league history. Following his final season with the Heat, James opted out of his contract and re-joined the Cavaliers. Behind his leadership, Cleveland immediately advanced to two consecutive Finals against the Golden State Warriors, winning the championship in 2016.